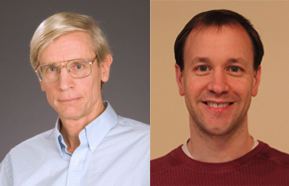 Congratulations to Ian and Mark for receiving the 2014 Canadian Association of Physicists Medal and Award! Dr. Ian Affleck is awarded the the 2014 CAP/DCMMP Brockhouse Medal "for his original and influential contributions to the theory of condensed matter systems, particularly in the application of conformal field theory techniques to the Kondo effects and quantum impurity problems and advances in the theory of quantum magnetism in low dimensions." He is known for developing theoretical work that can be applied to experimental problems. His research interests include superconductivity, low dimensional magnetism, quantum wires and quantum dots. Ian was elected as a Fellow of the Royal Society in 2010, and received the 2012 American Physical Society Lars Onsager Prize. In addition, Ian has volunteered for the UBC Physics Olympics competition as a judge for the Fermi Question activity since 2010. Dr. Mark Van Raamsdonk receives the 2014 CAP-CRM Prize In Theoretical And Mathematical Physics "for his highly original, influential contributions to several areas of theoretical physics, including string theory, quantum field theory, and quantum gravity. Highlights include advances in the theory of D-branes and other non-perturbative objects in string theory, the ultraviolet-infrared mixing in non-commutative quantum field theory, and the deconfinement transition in gauge theory, as well as his novel proposal that the emergence of spacetime is profoundly connected with quantum entanglement." He won the 2010 Gravity Research Foundation Essay Competition with his essay Building Up Spacetime with Quantum Entanglement, and received the Killam Teaching Prizes for 2011/2012. He also organized the department's annual concert, and played saxophone during the concert with other colleagues. They will be presented with the medal and award at the 2014 CAP Congress at the Laurentian University in Sudbury, Ontario, from June 16-20.